So I'm keeping my promise! I was hoping to cook (and photograph) my Oxtail stew again this past week, but remembered being told that I am not supposed to be eating beef so soon after my surgery. I know it is an old wives' tale, but decided to heed advice since it really costs me nothing to do so. Roboman lapped it up. He really enjoyed this. The meat had great flavour and was very tender. If there is a meat lover in your life, or if you are one yourself, you have to try making this! 1. Season oxtail parts with a sprinkling of salt and pepper. 2. Mix ketchup, balsamic vinegar, mustard, garlic powder and Worchester sauce in a bowl. 3. Place carrots in the slow cooker and layer potatoes on top. 4. Heat some olive oil in a skillet or pan and quickly brown meat slightly on all sides. 5. Put meat on top of potatoes and place mushrooms on meat. 6. Pour the prepared sauce mixture in the bowl over all the ingredients. 7. Cover and turn on the slow cooker. Cook for 4-5 hours. After about 2.5-3 hours, occasionally push down any ingredients that are not covered in liquid. If preferred, add thickener. 8. Serve with bread and a salad, or hot pasta sprinkled with freshly grated Parmesan cheese and a handful of baby spinach. 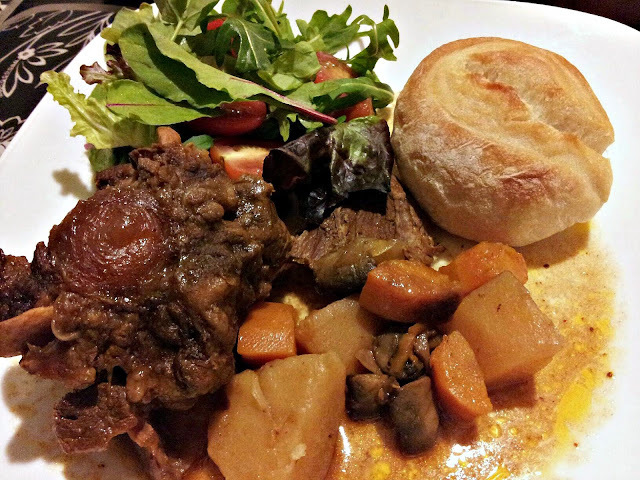 *I have also done this recipe with Beef Short Ribs, but prefer the Oxtail version.